"I think using animals for food is an ethical thing to do, but we've got to do it right. We've got to give those animals a decent life and we've got to give them a painless death. We owe the animal respect." It seems only fitting that my first post be my number one go to meal for healthy, natural and sustainable nourishment throughout the fall and winter months. On any given Sunday afternoon from October thru April, it’s not uncommon to see a big pot of my Lightened-up Portuguese Style Soup simmering away on the stovetop. Not only is it delicious, but it also exemplifies my whole philosophy on food. It's absolutely 100% natural, totally healthy (with a balance lean protein from a small amount of beef and large helping of mixed beans and vegetables like carrots and lots of leafy greens), and finally it's probably one of the most sustainable foods you can ask for during the winter months when living in the frigid Northeast (1 pound of beef becomes 12+ meals and carrots, dried beans, cabbage, collards, and mushrooms are all winter vegetables). 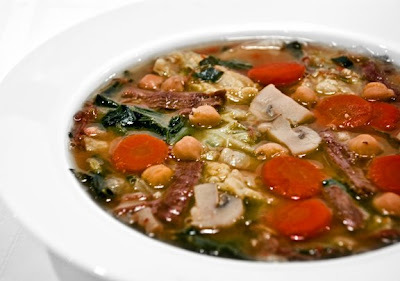 Traditional Portuguese Soup is pretty similar to my version except it usually contains a few ingredients that don’t fit into my low cal lifestyle, including: Portuguese chourico, a much fatter cut of beef, potatoes, and pasta (don’t get me wrong, the traditional version is absolutely delicious, just not low cal). Fill a very large pot with water and set on a high flame. Add beef, navy beans, garbanzo beans, split peas, crushed red pepper, 2 tablespoons kosher salt. Bring to a boil then reduce heat and simmer for 2 hours. Meanwhile coat the bottom of a small sauté pan with olive oil. Sauté onions over medium heat until caramelized (this can take at least 20 minutes). When onions are done stir in garlic and cook for one additional minute. Remove from heat and set aside. After the bean and beef mixture has simmered for 2 hours check to see if the garbanzo beans are cooked through. They will be soft to the bite and almost falling apart. If they are not cooked continue to simmer checking every 20 minutes. Using a large slotted spoon remove approx. 2 cups of the beans from the pot (this will be the garbanzo and navy beans only, split peas have dissolved), set aside. In a separate pot bring a few quarts of water to a boil to replenish the pot since the water level of your soup will now have evaporated by half. Continue to simmer beef for another 3 hours. Using the slotted spoon remove the beef from the pot, set aside. Add the carrots to the pot and simmer for 20 minutes. Add in the mushrooms, cabbage, and collard greens. Simmer for approx. 20-30 minutes until the collards are fully cooked and no longer tough and bitter. Meanwhile, shred the beef into bite size pieces. When collard greens are fully cooked add the beef, reserved beans, and sautéed onions to the pot. Allow soup to come back to a boil and then turn off heat. At this point, I like to rapidly cool down the soup by submerging the whole pot in my kitchen sink filled with 6 inches of cold water and lots of ice. Once soup is cool enough to try, check for salt – it will probably need a lot. Keep adding kosher salt in small increments and tasting until the soup is perfectly seasoned. Recipe makes more than 12 meals but freezes well in individual servings. My stomach can attest to this recipe's yumminess!